2 1/2hr Play party. This option is the best choice for when you want a fully catered party but want to maximize play time for the children in the huge awesome air- conditioned playland and don’t want organized party games. Our play parties are setup in the restaurant area of the venue. 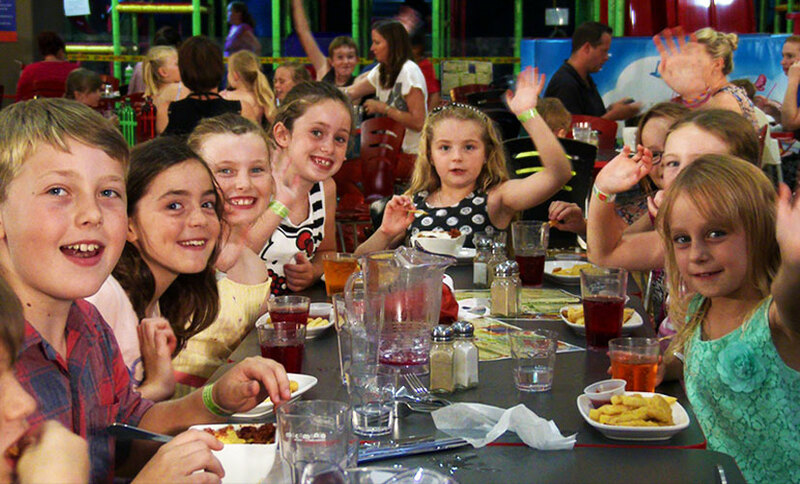 Play Parties are set up on tables in a reserved area of the Restaurant for 2 1/2 hours with Food and cake served by a Party Host, Up to 8 Children are included in base price. Children are free to play on the equipment at any time. Approx 1 Hour after arrival we will make an announcement that the party food is ready and our floor staff will assist with rounding up the children. A Host will deliver and assist with the food distribution. When it is time for the cake (we will organise a suitable time with you on the day) we will make another announcement and a Host will return with the Birthday Cake and assist with singing Happy Birthday and the cake distribution. You have unlimited time to stay and play however if staying for more than 2 1/2 hours you may need to move to the general table section if required. FREE entry to the Adult Carer of each child attending the party. Limited Adult seating is provided. Should you wish to cater for more Adults please discuss your requirements with a Party Consultant. Book Classic Play Party Package Online Now! Book Meal Deal Play Party Package Online Now! Book Awesome Play Party Package Online Now! Book Healthy Eats Play Party Package Online Now! All the options and party information are listed in the menu tabs below. You can also choose your package and book online using the links in the Packages tab below. Great party choices, information and options to personalise your party. You design the party that suits your requirements. then customise your party further with themes, cake upgrades and options to create the party that is right for you. or call our party consultants on 0249238700. An Individual Party Meal per child served with Hot Chips. Single Meal OR Alternate Serve Meal selection available per party. Talk to our Party Consultants if you wish any changes. Add a piñata filled with awesome novelties, treats & lollies. Ask our consultants to see our available range. Want to cater for the Adults? We have a range of adult platters prepared by our inhouse Chefs available to choose from. -Your booking is not confirmed until you have paid your $100 deposit. This deposit is non-refundable.  Any promotional vouchers MUST be presented when paying your deposit. -Food Platters for your adult guests and Food selections for the party MUST be ordered by the confirmation date printed  on your invoice. We ask that you make your food selections as soon as possible after booking. Platters ordered after this  date will be supplied if time and catering permits. Platters cannot be cancelled within 7 days of the function. -The party numbers you give us when booking will determine the size room allocated. Parties with a minimum of 16  children will be allocated a double size room if available. If you are looking at having 16 or more party children or expect  a large number of adults to be present in the party room please inform us on booking. If your final party numbers greatly  exceed your estimated numbers the room size may not be adequate. – IT IS IMPORTANT that final party numbers and food choices must be confirmed by the confirmation date on your invoice (generally at  least 7 days prior to the party date) and party room seating and catering cannot be amended on the party day. All children  attending the party will be charged the full party price (Children under 12months are free and are not catered for) As with  any function if you have any no shows you will still be charged for final confirmed numbers we have recorded at the  confirmation date shown on your invoice as this is what we have catered and prepared for. – Accompanying children who are not attending the party that are here longer than 15mins (dropping off) are charged at  the general play rate. -Return your completed guest list to reception on arrival. -A responsible adult (over 18yrs age) must be present in the centre until the last guest has left. -The party balance is payable upon arrival. Payment by Cash, EFTPOS, Visa, MasterCard or American Express. -Bags for shoes and presents can be provided. – The operation of the party will depend on the style of party you have selected. Please refer to your invoice for details of  the content and operation of your selected party. – If at any time you have any questions or concerns at any time please ask your host or the  duty manager immediatley to ensure the continued smooth operation of your special event. -Hand out any shoes, loot bags, cake etc and Leave all the cleaning, stains and mess behind you!